Prague is one of my favorite European cities. It’s beautiful, romantic, and filled with history and culture. But my favorite thing about Prague is that it is also filled with quirky, unique sculptures and statues. 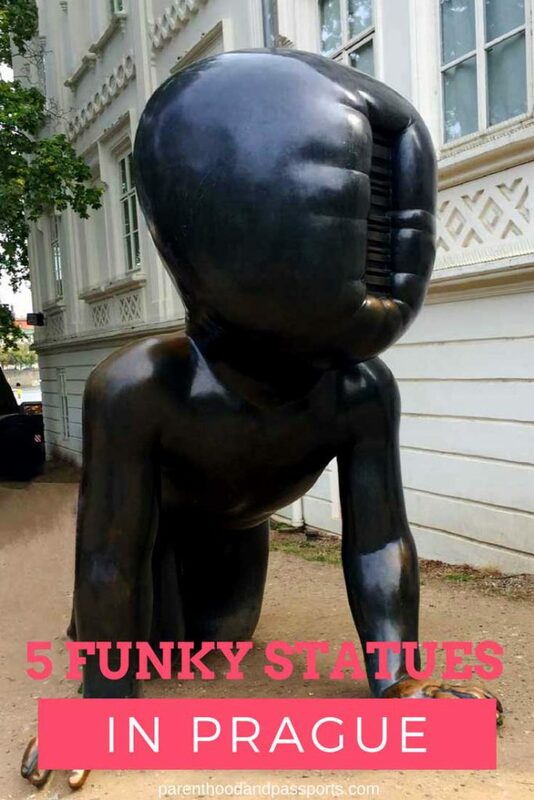 Here’s a quick look at my five favorite statues in Prague. 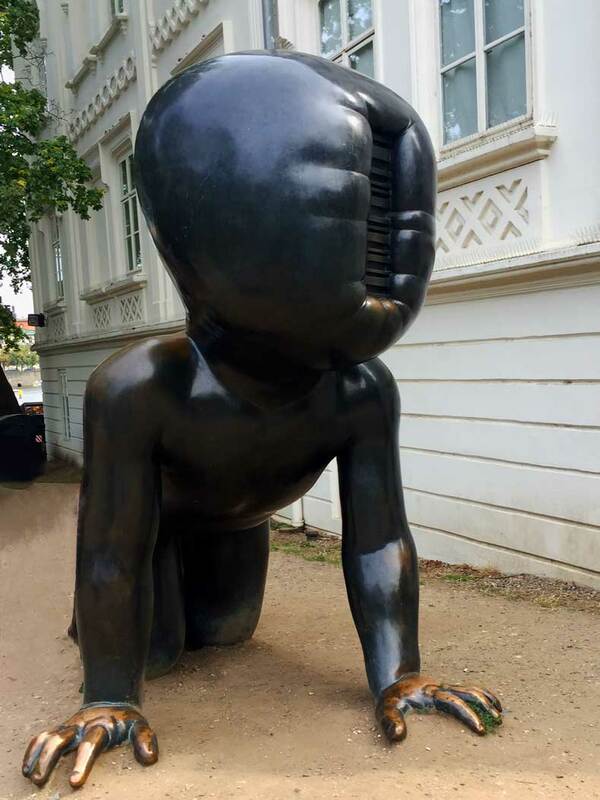 I didn’t know what to think about these giant crawling baby statues in Prague. You can find them in Kampa Park just south of the Charles Bridge. This public art display called Babies was created by sculptor David Černy. While it is intriguing, weird, and kinda disturbing, it is also fun for kids. Literally, kids were crawling up the butts and mounting these faceless babies as only innocent children and drunk people would. It was actually kind of hard to get a good picture of the crawling baby statues because there were playful children all over them. The same mastermind who created the crawling babies statues also designed this work in Old Town. The statue, called Man Hanging Out, will make you do a double take. You’ll just be walking down the street, having a Trndlo and then – Bam! – you glance up and see a guy hanging by one hand off the top of a building. The 7 foot statue of Sigmund Freud can be found at the intersection of Husova and Skorepka in a busy tourist district. What I love about this statue, beyond the fact that it is entirely unexpected and takes you off guard, is that at closer inspection, the statue isn’t as hopeless and tragic as it seems. 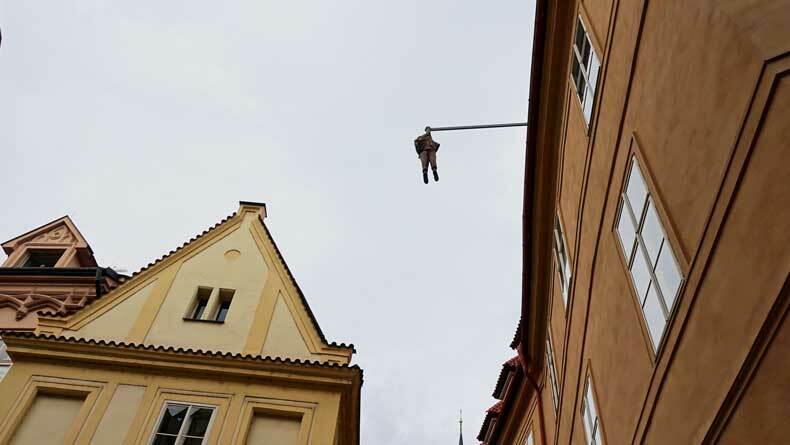 While the man is dangling by one hand, seemingly seconds from falling to his death, his other hand is casually tucked in his pocket. He literally appears to just be hanging out, as the name of the work implies. “the creepy, cloaked, faceless guy”. The statue sits outside Estates Theater, often referred to as Mozart’s Theater. It is a depiction of the ghost in the opera, Il Commendatore. But for the slightly less cultured, like myself, it’s just another one of Prague’s disturbingly amusing pieces of public art. 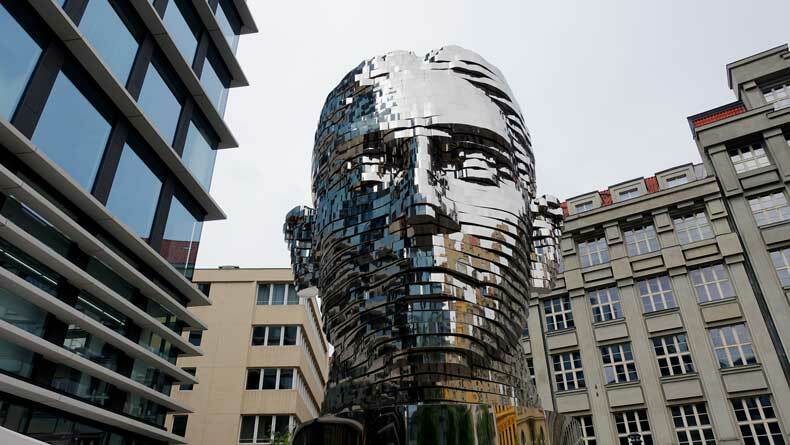 The Franz Kafka monument is a sculpture in motion. The 42 pieces that make up the turning head statue in Prague are stacked on top of each other in layers. Each piece twists and turns, eventually aligning to form the face of the famous 20th Century Czech writer. The statue is kind of hard to find. It is located in a business district and is tucked back off of the main road, so as a tourist, you somewhat have to be looking for it to find it. 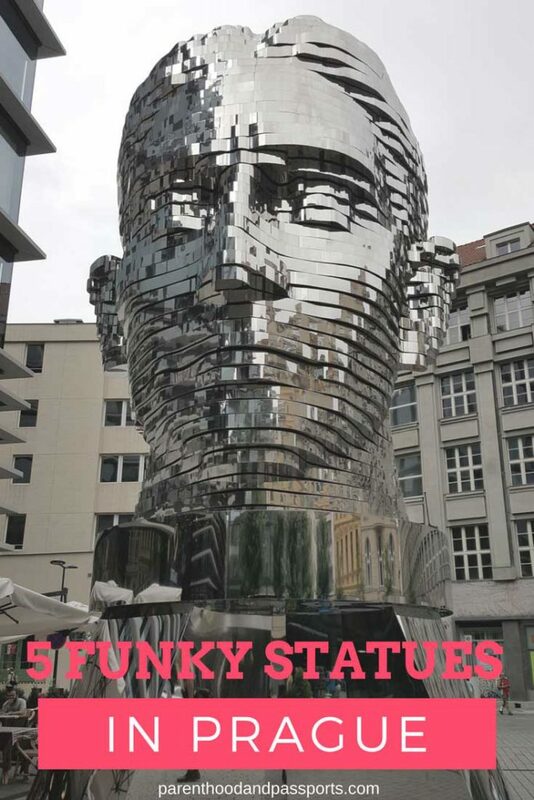 These are just a few of the unique and quirky statues in Prague. There are numerous more that we didn’t get around to visiting. Prague is a wonderful place where art doesn’t have to be understood to be beautiful. Beyond these spectacular statues, there are also so many other Instagram-worthy photography spots in Prague. During a trip to Prague, you’ll find yourself constantly taking photos of colorful streets, gorgeous castles, and historical landmarks. The beauty of this city is just one of the reasons I fell in love with Prague. 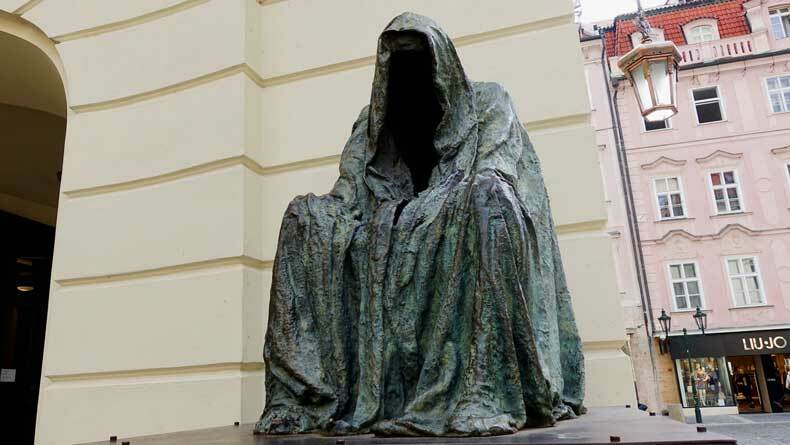 Have you seen any of Prague’s famous statues? What is your favorite statue in Prague or anywhere else in the world? I haven’t been to Prague in 10 years and most of these art installations weren’t even around when I was there! So jealous! But I do LOVE Prague and hope to go back in the near future. Great post! Love this! I did a bike tour in Prague a few years ago and saw most of these, plus a few more. They’re seriously out-of-this-world, especially the babies and the hanging man. But who could ever forget the peeing dudes? The peeing statue is the best! I bet even the artist laughed to himself when he started sculpting it. I’ve never been to Prague but I have heard so many people saying that they loved visiting this city. I like this unusual fountain where two life-sized bronze men are peeing 🙂 I have the impression that the bronze shape of the basin below is the shape of the Czech Republic ? I also love the head of the famous Czech writer, Franz Kafka…I imagine that this piece brilliantly reveals Kafka’s tortured personality and would make sense to anyone who has read the stories from the great Czech writer. What a great interpretation of the Kafka monument! So very true… And yes, the fountain the men are peeing in is the shape of Czech Republic and the two men are actually writing letters with their pee, although I don’t know what the letters spell out. I was just in Prague recently! I loved the creepy faceless cloaked guy haha. And the one of the guy hanging off the building! I didn’t get a chance to see the others, but I wish I had! I wished I would have gotten a better picture of all the statues but especially the guy hanging off the building. 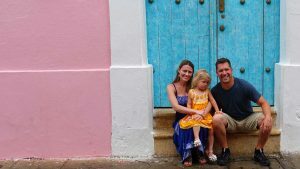 At the time I didn’t know or think I would be blogging about it. I visited Prague 10 years ago and really loved it! My best is the 2 guys peeing. i dont remember seeing any of those statues. Most probably i was focusing to hot dogs ? Haha! We had our fair share of hot dogs, as well! Super cool and unique post. I’ve seen a few before such as the huge turning head. I think there might be one more statue that is in the Old Town Square as well, but can’t remember what it’s like. i may be wrong though, it’s been a while since I’ve been there. Out of all of these, I thought the turning head was the hardest to find! Glad you enjoyed the post. Thanks for commenting!